I love (good) books on screenwriting, because of all the available guides to writing fiction, these focus most squarely on the primacy of story; first the forest, then the trees. 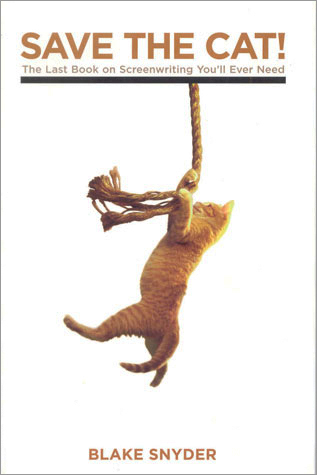 Last week a fortunate weblink led me to Save the Cat, 2005, a brief but idea packed gem of a book by Blake Synder (1957 – 2009). Snyder was a successful screenwriter and a respected teacher who began his career in movies doing voice-overs for his father at the age of eight. By his own admission, when he started writing for movies, he had only a vague idea of structure. Discovering Syd Field’s Screenplay was a revelation: “truly career-saving,” Snyder says, but there were still gaps in his sense of movie architecture. Snyder developed the methods he presents in this book in response. Because he spun things in an unusual way, and uses his own terms for concepts that may have become overly familiar, his methods move the imagination in fresh ways. The title of his book, for instance, is a code for his belief in the primacy of creating characters we want to follow. In the opening scenes of older movies, the protagonist often did something nice – like saving a cat – to bond with the audience, a step contemporary movies often skip in favor of showing a lead who is hip, slick, and cool. Snyder cites this as the cause of failures of several recent films. Snyder then suggests we do something that few writers ever dream of – pitch the concept to strangers. He would literally pick people out in a Starbucks line, and say, “Excuse me, I’m working on a movie concept, and I wonder if I could get your feedback.” Since he lived in L.A., the answer was often yes, but he challenges us to do the same wherever we are. I’m sure this is old news to the screenwriters who read this blog. If so, pass it along to your novelist friends; it seems we don’t get out often enough. This entry was posted in Authors, Book Reviews, Books, Movies, Screenwriting, Writing and tagged authors, book reviews, books, movies, screenwriting, writing. Bookmark the permalink. I liked seeing “a brief but idea packed gem” at the beginning of your review. I never have enough time, so brief and packed works for me. Thanks for the information. I will put this on my long, long TBR list. One of my 2012 resolutions is to look at my story idea from other genre perspectives, so I purchased The Playwright’s Guidebook by Stuart Spencer and The Coffee Break Screenwriter by Pilar Alessandra. This is the third mention of Save the Cat I’ve seen in as many days. I trust your reviews and the book seems tailor-made for my goal, so I’m going to order this. Thanks, yet again, for inspiration! One of the key elements of Save the Cat I didn’t mention was his “Beat Sheet,” which divides the three act structure into 15 key moments. I haven’t studied them all in depth, but I could certainly recognize the initial ones in watching Sherlock Holmes earlier today – which, BTW, is a really fun movie – much better than the first. I think you’ll find Save the Cat very useful. I think I already mentioned this in another response, but it was fun to watch Sherlock Holmes today, not only because it was a very good movie, but also, because I could really spot some of the structure Snyder discussed and outlined. Really made me appreciate the plot weaving even more. Wave the flag for “Save the cat!” . I think the true value of all these writing books is making you look at the way you write, making you think about your process. It never hurts to come at things from a different direction now and again. Agreed, and since plot and structure are not my strong points, those are the areas where I look for help.